The crow is one of my favourite birds. They often come into our village, and you hear their croaking sound, and you see them in the surrounding fields, usually in small family groups, looking for grubs and seeds. Their nests are cup shaped, neatly made, and near the top of trees, in small groups. There have been crows nesting in the nature reserve for as long as people can remember. Crows are omnivorous: they eat food from plants and animals. If they get a chance, they will steal and eat eggs and nestlings. They are particularly the enemy of black headed gulls, who lay their eggs all at the same time, in open colonies on the ground. Before you feel sorry for the gulls, remember, they take the eggs and nestlings of tern, who in turn... Crows will steal food from other birds, people report seeing pairs of crows managing to confuse and steal freshly caught fish from heron. People often ask - how do you distinguish crows from rooks? They are the same size and shape, and are mainly black. If you see a lone black bird, or a small group, then they are pretty definitely crows. If you see a large flock of similar birds, flying together, or on the ground feeding - they will be rooks. Rooks differ in having feathers at the top of their legs, which look like football shorts. Again rooks have a bald patch, which is dark grey, by their beaks. The crow is one of several species of black bird living in Britain, and behaving in a similar way. They are all called the corvidae. 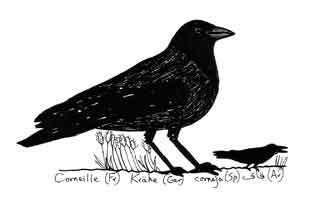 A rather larger black member of the corvidae is the raven. You will recall the Bible story - of how Noah released a pair of ravens, to seek land. There are no raven in our part of the world. They prefer wild, high altitude moorland. 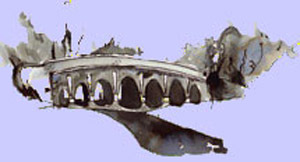 However, there is a small colony of raven, artificially maintained, at the Tower of London. Another member of the corvidae is the jackdaw. Extremely common in our village, nesting in chimney pots, and perching on house roofs. The jackdaw is the only British bird with white eyes. Corvidae are intelligent birds. They communicate with each other by body language to show friendship, aggression, dominance and submission. They have a nuptial dance which they perform when they want to mate. They have a variety of cries which tell others about danger, or new sources of food. If you visit Ireland, you will see no crows. You will see a similar sized bird, which behaves in the same way but is not a carrion crow. Its head, wings and legs are black, but the body is grey - tinged with pink. It is the hooded crow - which people often call a hoodie. The question is - is the hoodie a different species from the carrion crow? In parts of Europe, hoodies and carrion crows live alongside each other, but make no attempt to interbreed - which is the mark of separate species. If you visit Scotland, you will see hoodies, and in northern England there is a region where hoodies and carrion crows live and flock together, and mate - producing fertile offspring, who will mate with either hooded or carrion crows - which is the mark of a single species. I have an ornithological book which treats hoodies and carrion crows as different varieties of the same species. We are always hearing stories of birds, plants and insects under stress because of changing farming practice, pesticide misuse, urbanisation and global warming. The good news is that crows and corvidae in general are all thriving. There are over a million breeding pairs of crows in Britain. Long may they be around!